There is a story of a holy man who attended to the common tasks of life as any other ordinary person. Those who met him did not suspect that they stood in the presence of a saint of God. However, the angels knew it. One night, as he was rapt in the ecstasy of communion, the angels visited him and took the dust of his feet. As they were about to depart, they said to him:- "O saint of God, let us know what you desire. We fain would leave with some gift!" The saint smiled and said:- "I have no desire, I have but the longing to love the Lord to distraction!" "Do ask for something if only to make us happy. May we leave with you the wealth of the world? You are so poor!" "Wealth is worry!" answered the saint. "What shall I do with it?" The angels said :- "May we give you power over men?" "Power is poison. I have no need of it!" "May we give you the gift of reading the minds of people, of knowing their innermost thoughts and secrets?" "I read the Book of the Heart," the saint answered. "That is enough for me. It contains the whole science of loving!" "May we give you the gift of prophecy, of knowing what the future hides?" the angels suggested. "There is no future for me," was the simple answer of the saint; "and there is no past. I live in the eternal now and here! Free am I from the memories of yesterday and the hopes of tomorrow!" "May we give you the gift of healing?" "The Name of my Master is a healer," answered the saint. One after another, the proposal of the angels were turned down. Then the angels conferred among themselves and decided to so bless the shadow of the saint that whenever it was behind him, it would radiate health and happiness and peace to all on whom it fell; but if the shadow fell in front of him, so that he could see it, no such thing would happen. And the saint passed through life not knowing himself how much healing there was in his shadow. Such a one was Sadhu Vaswani. He lived a hidden life in the hidden God. He had no desire. He worked and asked for no reward. He only sought opportunities to be of service to his fellow-men - fellow-creatures. He went deeper and deeper within himself. He became a hidden root. God blessed the root, and out of it sprang roses of wondrous beauty and fragrance. In love and reverence he was called "Dada". The word means "elder brother". He was, verily, too, of birds and animals, - a brother of all creation. Of him it was said, many years ago, by the eminent French savant, Mon, Paul Richard: "I have been blessed. For amidst the deserts of Sind, "I have found a true Prophet, a Messenger of the New spirit, a Saint, a Sage, and a Seer, a Rishi of New India, a leader to the Great Future, - Sadhu Vaswani." This Rishi of modern India realized the synthesis between the culture with East and of the West. In a world in which the new eternally clashes with the old from which it has evolved, Sadhu Vaswani was a link between the ancient and the new. I always found him fired with unparalleled faith in the limitless power of the soul and of human progress, believing humanity to be on the point of new knowledge, new power and new capacities. He believed in fellowship with all creation. "The creation of God," he said, "is bound by golden chains to the Feet of the One God, the One Divine Father of us all." At His Lotus-Feet are we all one -- men of different religions and no religion. No one is an alien in the Kingdom of God. All scriptures, he taught, were custodians of spiritual wisdom. Communism too, he said, enshrined a truth to which it owed its dynamic character. To him, therefore, all sectarian strife and quarrels in the name of religion were due to lack of understanding. "I belong to no sect," he said. "I adore but One God. And my faith is, -- to worship the One Mystery and to do good to all!" Sometimes I felt, when coming near to him that to touch the hem of his garment was to commune with God. His life had the fragrance of the rose and the benediction of the singing bird. There was a time when he rubbed shoulders with the tallest in the land. But he chose to walk the humble ways of life. He made of his life an offering at the altar of suffering humanity. He offered himself in the service of the poor, asking for no reward. Compassion flowed out of his heart in an endless stream. Not once did I know him fail in answering the call of human suffering. Service of the poor was the worship he offered to God, everyday. Every day, he sat underneath the trees he loved, and gave to the poor and broken ones who came to him in large numbers. He gave them money; he gave them food; he gave them clothing; above all he gave them the benedictions of his loving heart. And they have come to me -- the poor whom he loved and served, -- and with tears in their eyes, they have said to me; -- "Our Dada is gone; to whom shall we go now?" Till the last day of his earth-pilgrimage, he served the poor and broken ones. In their faces he beheld the Face of God. Every human being, every creature was, to him, an image of the King of Beauty. To bring joy into the lives of the starving, struggling, sorrowing ones was one of the deepest aspirations of his life. A man came to him one day, and giving him a bundle of notes, said:-- "Here is money for your temple." And what did Sadhu Vaswani do? He utilized the amount in feeding the poor, saying:-- "The noblest temple is the heart of a poor man who gets his food and who blesses the Name of God!" Sadhu Vaswani was born on November 25, 1879, in Hyderabad-Sind, a land that has given birth to many saints and servants of God and man. He was a brilliant student. Soon after passing the M.A. Examination, he was appointed as Professor in the Metropolitan College, Calcutta, -- now know as Vidyasagar College. Even in those early days, he was inspired by the true spirit of patriotism; he played a significant part in the agitation against the partition of Bengal. He was thirty years of age, when he went to Berlin as one of India's representatives to the Welt Congress, the World Congress of Religions. His speech there and his subsequent lectures in different parts of Europe aroused deep interest in Indian thought and religion and linked many with him in India's mission of help and healing. He believed profoundly in the world- values of India's ancient culture. He set on fire the hearts of many with the vision to make the wisdom of India's Rishis world-dynamic. He became Principal of Dayal Singh College, Lahore. He believed that the end of right education is character-building. With this in view, he introduced a number of new features in college education. From the beginning of his days, his heart was smitten with love for the Lord; he longed to dedicate his life to the service of God and his suffering children. He was forty years of age when his mother passed away. His only link with earthly existence having broken, he resigned his lucrative job to enter into the larger service of the Nation. 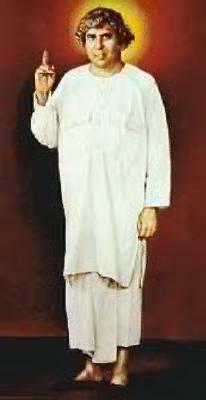 He renounced everything to be, in his own words, "a humble servant of India and the Rishis. He entered into the struggle for the freedom of the country. At that time, Mahatma Gandhi had appeared on the Indian scene and had launched his "Satyagraha" Movement. Sadhu Vaswani was one of the earliest supporters of Mahatma Gandhi's Movement and a close associate of Mahatma Gandhi. The very first article on the front page of Gandhiji's Young India (New Series) was an article by Sadhu Vaswani. He wrote also several books, -- including India Arisen, Awake! Young India, India's Adventure, India in Chains, The Secret of Asia, My Motherland, Builders of Tomorrow, Apostles of Freedom, -- exhorting the youths to dedicate their lives to the service of India, the Mother. Some of the books were proscribed by the then British Government. He was a patriot of the purest race serene. He was an apostle of Indian Culture. He was a pioneer calling India to the Great Future when she, who was once the Leader of Culture, would be once again a Teacher of the Nations, a Servant of Humanity. India, he urged, had a world-mission to fulfill. It was to reveal to a warring world, the synthesis of freedom and spirituality. "To be truly spiritual is to be truly free," he said, "for spirituality is inner liberation; and out of the inner are the issues of outer life." Later, Sadhu Vaswani turned his attention to education and other spheres, emphasizing that character-building is nation building. With this in view, he started "Youth Centers" in different places. He opened the "Shakti Ashram" at Rajpur, inspired by faith in the youths of India. He lectured in different places on the "Mission of Indian Youths", pointing out that Freedom was nigh, and that he looked to the youths of India for giving right direction to the life of the nation in the coming days. He held that India's youths were the destined leaders of the nation and should be trained and disciplined in order to fulfill the task awaiting them. In his work for the "Youth Movement", his emphasis was on shakti (spiritual vitality). He organized two "Youth Conferences". At the "Shakti Ashram" at Rajpur, he endeavored to train youths drawn from different parts of the country in the school of shakti for the service of India. The "Shakti Ashram" arrested the attention of a number of prominent persons and was visited, among others, by Mahatma Gandhi who planted a "Youth Tree" on the occasion of his visit to the Ashram. Of Sadhu Vaswani it was said in those days:-- "Who are the leaders of India today? In the West, among the names known for spiritual life and teaching are Mahatma Gandhi, Rabindranath Tagore and T. L. Vaswani. India is blessed with Vaswani who asks the youth of India to build a bridge of brotherhood between the East and the West." V. I. Copper of New York spoke of him as "the Faraday of spiritual science". Baron Howen of France called him a "living leader of the world". Dr. Cousins, the Irish poet and mystic, called him a "forerunner of the New Age". Prof. Horwitz, the American thinker, spoke of him as a "path-finder and pioneer". During his visit to Poona, in 1967, Dr. S. Radhakrishnan, the then President of India, said:-- "Sadhu Vaswani was a true pilgrim who considered his work to be the spreading of enlightenment and comfort among the youths of this country&ldots; Sadhu Vaswani created a new climate, a new atmosphere." Sadhu Vaswani urged that a "new education" was necessary. "Our schools and colleges, " he said, "are our prison-cells. They keep out the sunshine of Indian ideals and Indian culture. This isolation of modern India's brain from the mighty Soul that made "Aryavarta a model nation, in the long ago, -- this is the tragedy of our life today." Sadhu Vaswani moved across the length and breadth of India. He went to the cities; he visited the villages. He met men and women and children. He looked into their needs. He found that the bodies of many were famished, their souls were impoverished. And he called upon the people of India to organize themselves for the service of humanity. He pleaded for the birth of a new physical culture, a new spirit of adventure, a new love of danger and difficulty. His message to Young India was:-- "Be simple, be manly, be strong! And spend your strength in the service of the poor and broken ones!" Sadhu Vaswani pleaded for a new peasant renaissance. "The masses form the nation," he said. "Civilizations decay in the measure the quality of their mass-stuff is poor. The worst slavery is the slavery of the poor. How to abolish it? Land, I regard as the one thing needful. Redistribution of land is essential to my scheme of Swaraj. Give land to the poor and teach them scientific methods of intensive agriculture and cooperative organizations." In 1933, Sadhu Vaswani founded the "Mira Movement in Education" which has, today, its headquarters in Pune. The Movement was started in Sind and plans were afoot to develop it into a Mira University, when the "partition" came to paralyze the best efforts of the enlightened men in Sind. The Mira Movement attempts at enriching students with vital truths of the modern life and at the same time making them lovers of the Indian Ideals and India's Culture, at once idealistic and spiritual. Such an education is essential to India's social and political salvation. The emphasis in the teaching passed on in Mira Educational Institutions is that education is a thing of the Spirit and that end of all knowledge is service, -- service of the poor and lowly, the sick and the afflicted ones. In 1962, Sadhu Vaswani started St. Mira's College for Girls. It is inspired by the faith that, in the new unfolding of India's destiny, women have to play an important part. As Sadhu Vaswani often said:-- "The woman-soul shall lead us upward, on!" And while students in the College are trained to show good results at the University Examinations, the emphasis in the teaching passed on to them is on three things:-- (1) character-building; (2) heroic living; and (3) spiritual unfolding. A number of humanitarian activities are being conducted at Pune under the ever-living guidance and inspiration of Sadhu Vaswani. They include a 200-bed hospital and dispensaries where hundreds of poor patients receive free medical aid; St. Mira's College and St. Mira's Schools where education is given free to poor students; a "Welfare Fund" which sends out financial aid to the poor and needy in different parts of India; a Publication Department which publishes books and journals interpreting the wisdom of East and West, -- two of the journals (in English) being , the " Mira" and the "East and West Series", which continued to carry to the remotest parts of the world, the message of Sadhu Vaswani which is the message of world-peace, of compassion to all creatures, of the harmony of East and West, and the fellowship of all races and prophets and saints in the one divine mother, -- Humanity; a Home of Service where women are given opportunities to earn their livelihood; a Jiv Daya department dedicated to the welfare of brother birds and animals. Sadhu Vaswani worked on, day after day, -- wanting nothing for himself, seeking only opportunities to serve the poor, the lonely and the lost. His body was weak, and for a number of years, he was unable to move but he felt he had "the strength of ten", because in his heart was love and every fiber of his being thrilled with faith in man and God. He kept away from honors of the earth and always rejoiced in wisdom as his wealth and the service of the distressed and the oppressed as the treasure of his quest. During the latter part of his life he was revered as a saint and crowds followed him wherever he went. He was never tired of asking all who came to him for blessings and guidance to go and break with the needy the bread in love; for to live is to give. Religion, to him, was not rites and ceremonies, not creeds and conformities. "Religion," he said, "is life, is fellowship, is mingling of the individual with the Great Life. And this is not shut up in the temples. This is moving in the market place. The Great God is not somewhere in isolation. The Great God is in the procession of life. Greet Him there! You will not find Him in the temples of marble and stone. You will meet Him in the sweat and struggle of life, in the tears and tragedies of the poor. Not in decorated temples but in broken cottages is the Great God, - - wiping the tears of the poor and singing His new Gita for the New Age!" Sadhu Vaswani was a born orator. When he spoke, he filled the hall with the rich music of his words and the richer music of his heart. His words,-- both spoken and written,-- gave a new awakening to many. He was a poet, a mystic, a sage, a servant of the poor. He was not only one of the noblest of human beings, but, also, as the Irish poet, Dr. Cousins, called him, "a thinker and a revealer of the deep truths of the Spirit." Sadhu Vaswani re-worded the wisdom of the Rishis. He taught that all religions are true, that each had a value of its own. He taught that in all the saints and prophets shone the One Light. He asked all to turn away from creeds and dogmas to the Religion of Life, the Religion of Self-realization, the Religion of God-consciousness, the Religion of the One Spirit who is in all races and religions, prophets and saints. He was an eloquent prophet of unity. In this beautifully produced volume have been brought together some of the pictures of Sadhu Vaswani taken on different occasions, -- mostly without his knowledge. There was a time when we would not permit his picture to be taken. When asked to be photographed, he would invariably answer:-- "Photo kam khoto!" "Photo is phantasy, illusion!" "I had to send my photo to get a passport to Europe and America. I stood before a photographer. He adjusted his instrument and said to me:-- "Be still!" Not to be still would be to get a blurred picture." "God, the Great Artist, would paint us beautiful pictures. Therefore must we practice silence. The purpose of meditation is to train the mind in stillness. The melody of the modern age is its over-activity, its lack of stillness. Be still to know the Lord!" When he saw the photograph, he liked it. It was beautiful and bright, radiant with an unearthly light. He saw his own face after a long time; he had not looked into a mirror for many years. After this, there were many occasions when he did not object to his photograph being taken, though he rarely "sat" for one. The passport picture was a "bust" photograph. Several brothers and sisters, deeply devoted to him, desired to have his full photograph, -- with his lotus-feet. In India, the feet of a holy man are regarded as objects of worship. On his sixty-second birthday, a dear friend to whom he could not say "No", took him to the well-known studio of J.J. Mehta at Karachi, and had his full photograph taken. This photograph became very popular and has gone into print many times over and adorns the altars of worship in myriad homes. In it you may see him standing with a far-away look in his eyes, a finger of his right hand held high, as though calling upon all who would hear him:-- "One is your Father in Heaven! No separation, brothers! Ye all are one!" Hundreds of Sadhu Vaswani's photographs have been taken on diverse occasions. They remained hidden in the "albums" of a few individuals. They awaited skillful hands to publish them for the benefit of the many. This book is a humble attempt in this direction. I am sure this volume published by the Sadhu Vaswani Mission of Bombay, under the beneficent guidance of the Chairperson, Mrs. Maya B. Ramchand -- a woman of culture and keen aesthetic perceptions -- will be of interest to many in the East and in the West who have received rich inspiration from Sadhu Vaswani's life and writings. They will see the Master in the pages of this book. They will see him doing many things, -- performing opening ceremonies, laying foundation stones, planting trees, addressing gatherings of men and women eager to listen to his words of wisdom. They will see this friend of the friendless ones sitting in the midst of the poor and lowly, feeding them, giving them clothes, speaking to them words of comfort and cheer. They will see him feeding brother birds and animals. They will meet him on the roadside as he goes out for a walk. They will find him underneath the trees, writing inspiring messages on beautiful green cards. They will watch him meeting men and women of light and learning in East and West. They will see him in the midst of the little ones whom he loved and who loved him. The mother looks at her children and feels happy; the mother-heart of Sadhu Vaswani loved children and looked at them and smiled and made them happy. And they will also see him diving into the depths, lost in the silences of the soul within. The value of this book is enhanced by the inclusion of a cross section of Sadhu Vaswani's great thoughts and teachings; his ideas and aspirations. These thoughts are selected from his writings, both published and unpublished. Our age, alas! lives in forgetfulness, and men measure civilization in terms of money and power. Standing on the edge of this broken, bleeding age, Sadhu Vaswani dared to hold in his heart the light of the ideals which alone make life rich and radiant. May some of those, who see him in the pages of this book and hear his authentic voice, re-capture some of the thrill of his thoughts and bear witness to them in daily life! "Which is Sadhu Vaswani's best photograph?" I was asked once. I smiled as I answered:-- "The Master's best photograph is yet to be taken. For his best photograph may not be captured on a film; it is a painting of his life on the tablets of our hearts." In his teaching the emphasis is on the Heart. In his life, action was blended with meditation and communion; and he spoke often of God's "revelation in the Heart". We live today, in an excited, agitated age. The one piteous need of this age is the teaching of God in the Heart within. Sadhu Vaswani was well aware of the tragedy around him, of poverty and exploitation, of violence and wars of impurity and hatred of the cruelty of man to birds and animals. But he believed profoundly in God's mercy and its power to make men new and re-kindle in their hearts the extinguished lamp of compassion and love. It is the religion of the Heart -- the Religion of the Spirit -- which the world needs today. Sadhu Vaswani in the faith that the Religion of the Spirit would be India's gift to the nations in the coming days. The Religion of the Heart, he said, includes and transcends the religion of words. The Religion of the Heart blends action with meditation and service. The Religion of the Heart teaches that the chanting of hymns in temples and mosques is of little value compared to the true prayer of service and sacrifice. The Religion of the Heart is the religion of mercy to all living creatures. Implanted deep in his heart was compassion for all creatures. He was a voice of the voiceless ones. Every little thing he did was inspired by the Vision Cosmic. One of his books -- an edition of which was published in Durban (South Africa), -- is entitled, All Life is Sacred. He heard the voice of suffering. The vibrations of an invisible lyre seem to descend on his soul from the very stars. "Kill not animals", he said, "kill only the animal within thee, thy little ego!" To him, as to St. Francis, birds and animals were brothers and sisters. He greeted them and poured upon them the love of his heart. Through his life and teachings, Sadhu Vaswani renewed the inner life of India and inspired by the truth of renunciation, brotherhood and love, he transformed the social life of countless men and women. The emphasis, today, is on forms of Government. Constitutions and political machinery, Sadhu Vaswani taught, have their value. But there is something greater, something truly vitalizing. It is the Vision of the One Life in all. Out of this Vision grows true humanism. And democracies, without the spirit of true humanism, -- as we have seen in the West, -- are in danger of developing aggressive nation-cults and imperialist ethics. And they move in a circle of violence and strife. Modern democracies have produced great leaders, -- great in organization, rich in resources, in their power over the mass mind. But more than leaders, more than organizers, the world needs today, men of true spiritual culture, men of understanding hearts, seers, sages, prophets, path- finders, way-showers, light-bringers, torch-bearers, apostles of the ancient way.